Born in Manchester, Steve started playing drums in 1983, at the age of fifteen and has become one of the most sort-after drummers in the country. He studied locally, and by 1992 he was playing with visiting Americans, including Harry Allen, when they toured in the area. He studied in New York in the early 1990s with Carl Allen and John Riley and played some dates with Harry Allen. As part of the Jim Hunt Quartet he was a finalist in the European Jazz Competition in Germany. He also worked in the Far East with Dave Newton, as well as playing in Spain and France. He moved to London in 1996, made his first recording the same year and his career took off. He has worked with almost every major British artist, and has accompanied many visiting American musicians, including Conte Candoli, Kenny Davern, Harry Edison, Art Farmer, Mundell Lowe, George Masso, Warren Vaché, Ralph Sutton, Junior Mance and Barry Harris. 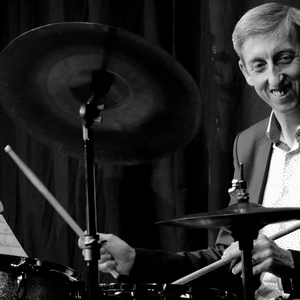 In addition to being part of Scott Hamilton's Quartet since 2000, he is a member of John Bunch's British trio, and has recorded a number of albums with both of these groups. His other studio credits include albums with Stacy Kent, Dave Cliff, various Alan Barnes groups for Alan's Woodville label, Dave Newton and Andy Panayi. Watch Steve playing with Barry Harris at the Pizza Express - Bouncing with Bud.